The design of the Carnival Elation is a celebration of the muses who inspire the arts, and the ship will inspire you… to have fun! Carnival Elation won”t have a hard time convincing you, either. There are plenty of spots for a drink, from the laid back Gatsby”s bar to the jumping Jekyll and Hyde Dance Club to the always-swinging Duke”s Piano Bar. There are places for a tasty bite as well, with from Tiffany”s on Lido Deck to one of two grand dining rooms, and even the Musical Cafe. If being a kid is more your thing, we have plenty for you to do. Age-appropriate, supervised activities are available from one of three youth spaces, there”s the video arcade… oh, and did we mention waterslides? We didn”t, but we should have, because they”re fun. 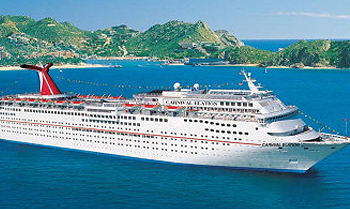 View all Carnival Elation cruises or view more options for Carnival cruises. Carnival Elation won’t have a hard time convincing you, either. There are plenty of spots for a drink, from the laid back Gatsby’s bar to the jumping Jekyll and Hyde Dance Club to the always-swinging Duke’s Piano Bar. There are places for a tasty bite as well, with from Tiffany’s on Lido Deck to one of two grand dining rooms, and even the Musical Cafe. If being a kid is more your thing, we have plenty for you to do. Age-appropriate, supervised activities are available from one of three youth spaces, there’s the video arcade… oh, and did we mention waterslides? We didn’t, but we should have, because they’re fun. You never need a special reason to enjoy brunch, but Carnival has the perfect one: sea days! When it comes to a variety of food served ina casual dining atmosphere, this is the center of it all. Grab a cone and choose from frozen yogurt or delicious soft-serve ice cream – the original heat blaster. Enjoy signature steakhouse favorite anytime, in our lively main dining room. Take a break and revive in style at our coffee bar, stocked with premium coffees and delicious pastries. Hungry enough to eat, but feel more like staying in? Relax. Complimentary room service is available 24 hours a day. Whether your kid loves to try new things or stick to a few faves, we’ve got something on their menu guaranteed to be a big hit. You’ve played Connect 4 and Yahtzee, but have you ever played giant versions of them onstage in a competition that puts your gaming skills to the test? You’ll have your chance when you take part in Hasbro, The Game Show. From SORRY! SLIDERS to YAHTZEE BOWLING, CONNECT 4 BASKETBALL, OPERATION SAM DUNK and SIMON FLASH, you can team up with your friends and family to win great prizes, all in front of a live audience. Be sure to check your FunTimes for show times so you don’t miss out on the action… or the prizes. so the only red faces in the audience are from laughing a little too hard. When was the last time you got up and danced at the theater? Playlist Productions takes tunes you know and presents them like you’ve never experienced before past favorites become full-blown musical productions featuring singers and dancers bringing down the house. Enjoy the spicy sounds of Latin Nights, or the larger-than-life favorites (and personalities) of Divas. Don’t forget Motor City which will have you dancing in your seat or even The Brits!, a swingin’ revue of your across-the-pond favourites. Enter the center of groove with the passionate Heart of Soul. Rounding out the lineup is the anything-but-square Getaway Island, the arena-shaking sounds of Epic Rock, the piano-pounding 88 Keys, the totally bad-meaning-good 80s Pop to the Max, plus the funky, sophisticated… and not at all exclusive Studio VIP, where everyone’s welcome to come and get down! Above the ship you’ll find the shining sun, but that’s not all – basking in its rays is a gleaming symbol of fun, a monument to merriment… a sign of splashy-good times to come. Spot the spiraling Twister Waterslide atop your Carnival ship and you can be sure that your vacation comes complete with twists, turns and squeals of thrilled delight. Countless gallons of water course through the entire length of this slide, so you’re by no means dry when you start, but by the time you reach the end – hundreds of feet later – you reach new levels of soaking, splashing down in that classic waterslide photo-finish: hands-up, eyes wide and nothing but exhilaration on your face. Go from normal vacationer to world-traveling art whiz in one cruise flat Carnival offers such a variety of educational and enlightening seminars that we should hand out Art History degrees at the end of each cruise! We may not be an accredited university, but your cruise features an Art 101 lecture series designed to be your entrance into this vibrant world. We will go from the earliest cave paintings to the modern masters with stops at topics like the Renaissance, Baroque, Surrealism and Pop Art and cover both theory and technique. You will walk away with a spectrum of knowledge to use at your next art auction… or to elevate your cocktail party chatter. On their Carnival cruise, kids can enjoy all the best parts of summer camp and family vacation, all in one! At Camp Carnival, they’ll start by splitting up into three different age groups: 2 to 5 years, 6 to 8 years, and 9 to 11 years. Our counselors, each with education or childcare experience, are there to make sure everyone in these small groups has an amazing time. And they do, with tons of fun-filled, age-appropriate activities including arts and crafts, dancing, movies, toy-time and video gaming! When it’s mealtime, kids get their own menus, with faves like mac & cheese, chicken nuggets, and more. And when the sun goes down, we offer Night Owls (fees apply) so kids get to stay up late having fun, while their parents also enjoy themselves well into the night.